After last winter’s walloping of snow and cold, this winter seemed easy. Mild temperatures and less than average snow fall made it possible for the Bay Club’s grounds team to get the course ready for the season, allowing the course to officially open on Friday, March 25th with high hopes for a great spring ahead. Since then, however, the number of days deemed “golf-worthy” have been few and far between. With a colder than average April and a wet start to May, members have been itching to get out and play. The Club has had to adjust the schedules for several events and weekly clinics due to the unfavorable conditions. There have been a handful of brave souls who have bundled up and powered through the dreary weather. 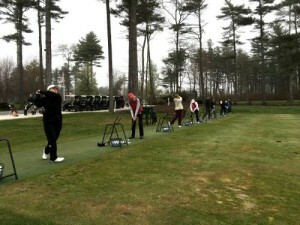 Just this weekend for example, Women’s Opening Day kicked off with another damp and cool day. It’s uplifting to see sunshine and climbing temperatures in the forecast this week, and we’re optimistic the brighter days will be the norm in the near future. But whatever the weather throws our way for the remainder of the spring, we are ready and raring to go. Please click on this link to sign up for occasional e-mail newsletters from the Bay Club at Mattapoisett. End of the Golf Season… Now What?